Along with a number of other people I received an email from the Norfolk police asking if I would mind asnwering some questions about CRUgate and the earlier, presumably related, FOI requests we made asking for the data. After a little email toing and froing, the detective concerned called me today to ask me some questions. The chat was amicable and in some ways it is worth blogging just for that. DC Baker utterly failed to ask me for DNA (or indeed any form of identity whatsoever) and completely forgot to get a fellow officer along to play good cop/bad cop and threaten me. I have to say that while this has been my usual experience of British policemen, sometimes, such as when they ask my wife to stop photographing Liverpool St Station, I have my doubts about whether the police can remain worthy of the respect of the law-abiding* majority. So I glad to say that out in the wilds of Norfolk at least policemen seem to be worthy of our respect. On the other hand the interview did start with my being asked questions about my date of birth, address and who my ISP was. These were, I was told, completely voluntary but "were on the form". I'm not at all sure what the latter one was for or why it was on the form. But moving along slightly, to the topic of our discussion. Firstly I had semi-official confirmation that the "inundation" of FOI requests that the CRU/UEA complaiend about was no more than 60 or so and that many were, if not duplicates, asking very similar questions such that gathering the information for one would also have provided the information for others. In other words they weren't overwhelmed and if they actually had some kind of data management strategy beyond Phil Jones stuffing things at random into filing cabinets they could have responded without causing work for some secretarial folks. Worst case they coud have abused paid a grad student or two for a couple of days work. Secondly it seems that the CRU's nobbling of Mr Palmer - the UEA's Information Policy & Compliance Manager - to get him to go along with the CRU's attempts to not respond have landed that gentleman in career limiting trouble. He may also be facing criminal charges I don't know whether his stonewalling will end up being considered to be in breach of the FOIA but they may well be, and unlike some other stonewalling documented by the emails, the six month time limit for allegations of FoI noncompliance to be reported will not have run out. His final response to me (for example) is dated 18 September 2009 and I'm pretty sure that it indicates FoI noncompliance. Furthermore I suspect that Mr Palmer and Dr Jones & co may well be facing charges like perjury because the document makes statements regarding the confidentiality agreements allegedly in place with various third parties which I believe have subsequently turned out to be utterly false. Thirdly the police have apparently been told to call the original posting of the FOIA zip file a "data breach" and that most of the people asked incline to it being an inside job. Also, relatedly, it sounds like the inside job theory matched with the FOI stalling hypothesis leads us to an explanation of the timing of the release. In other words those frothing greenies who suggest that it was all intended to discredit Copenhagen are wrong. *Actually, given the various inane basturbationist laws inflicted on us by Westminster and Brussels we may in fact all be lawbreakers regarding the letter of the law but in spirit we aren't. In today's Wapping Liar there is an editorial comment by Professor John Houghton (former head of the Met Office, IPCC mover and shaker etc.) where he tries to claim that the IPCC should have been more robust in defending its documents and not feebly accepting that it got things wrong. This is an, um, interesting concept. It also seems to me to be a sign that Prof H is no longer someone that I would trust regarding scientific matters since he seems to have jettisoned all his scientific integrity. It is worth comparing his attitude with the Intiture of Physics who have received a certain amount of criticism for suggesting that Climate Scientists act like regular scientists and not a secret cabal. The IPCC is too big an organisation to be captured by an ideological cabal or fall foul of group-think. It draws in scientists from every discipline from many different nations. Climatologists from Benin rub shoulders with scientists from the West, and from Saudi Arabia and other petrol-states for whom belief in global warming is against their immediate interests. Firstly Prof H fails to point out that the IPCC's scientists are all nominated by governments and that governments are not always the neutral bodies some would like to think they are. More seriously he ignores the evidence that certain IPCC lead authors and section editors certainly did attempt to force through one particular viewpoint despite complaints from those who disagreed. See comments by Pielke Sr, Pielke Jr and McKitterick to name just three off the top of my head. The IPCC process also makes it impossible for green propaganda to be slipped in. The IPCC has published four reports — in 1990, 1995, 2001 and 2007. Each contains three volumes covering science, impacts and mitigation; in 2007 each volume was about 1,000 pages long. Their main content is a detailed review of thousands of peer-reviewed scientific papers. But a report from Greenpeace or any other campaigning body would not be included because the science would not be considered robust enough. This is in fact a bare faced lie. Some of the more alarmist chunks of sections 2 and 3 appear to have been sourced from the WWF, Greenpeace and so on. It is true that the main contesnt is a review of thousands of scientific papers but the bits that get the coverage - the reported imminent melting of glaciers, starvation in Africa, desertification of the Amazon rain forest etc. seem to have not come from such a rigorous process but to have come from "Greenpeace or [...] other campaigning bod[ies]"
A third myth is that the IPCC has refused to recognise that there has been no significant increase in global average temperature in the past decade or so. Sceptics cite this as evidence against human-induced global warming. But the level of natural year-to-year variability in the temperature record shows that a decade is too short a time to establish a change in the long-term trend. This section seems a tad over optimistic. I'm not sure what warming rates the IPCC itself put down but from the work by Lucia it is clear that the models used by the IPCC and others have, since around 2000, significantly overestimated heating. Indeed Prof Phil Jones himself said temps since 1995 had increased only at 0.12C/decade which is just 60% of the 2C/century that I've seen quoted in many places as the IPCC projected increase. Perhaps there is a criticism that can be made of IPCC scientists: they have been too slow publicly to defend their integrity. They have not been willing or able to hit the airwaves or make their case in newspapers. But scientists are now faced by powerful lobbies who are working to distort and discredit the science behind climate change. We scientists have facts on our sides — we must not be afraid to deploy them. I would say that if the IPCC scientists have failed to defend their integrity then that is perhaps because every time they seem to have tried they have been shown to have been somewhat economical with the actualité. Furthermore it is worth pointing out that the really powerful lobbies have, until recently at least, been solidly on the side of the IPCC and its band of alarmists. Politicians and government funding have all leant heavily towards the AGW is a danger side of the equation and funding of the skeptics has been minimal. Despite such minimal funding skeptics have demonstrated significant weaknesses in a number of IPCC sponsored claims regarding global warming. If anyone has been distorting the science it is the environmental lobbyists. 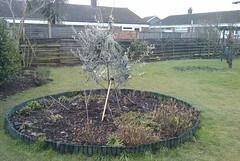 An English olive tree in a garden in Frinton on Sea. The tree is young but apparently flourishing. As always click on the image to see it enlarged and don't forget to visit of the olive tree blogging archives for further reminders of how nice olive trees are. 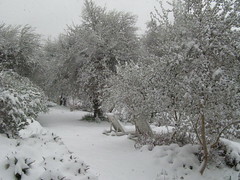 The Rivera received somewhere between 10 and 30 cm of snow yesterday and so today everywhere is an unusual colour - white. 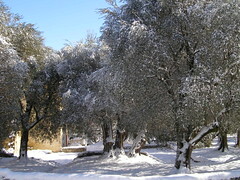 I'll be uploading more snowpocalypse photos but this one goes in the Olive Tree category instead. The photo was taken at Notre Dame du Brusc in Chateauneuf where I've taken a number of other olive tree blogging photos over the years. 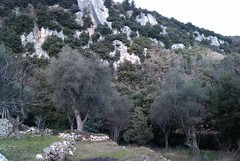 As always click on the image to see it enlarged and don't forget to visit of the olive tree blogging archives for further reminders of how nice olive trees are. I put this heading down as a joke when I started to write this post this morning. 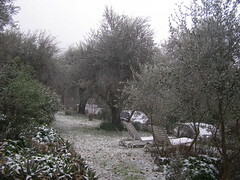 I expected to write about how stupid Meteo France were in warning us of snowfall and all we would get was maybe a light dusting. But I was wrong. We really are in the snowpocalypse as the snow has been falling solidly from just after breakfast and we now have a good 10cm maybe 15cm . It's very quiet as only are few hardy souls are venturing onto the roads and most of them are driving with chains (some realised the wisdom of this only after they encountered the first tricky hill/curve combo and put them on at the side of the road). We bought bread in the village - which was like a ghost town. 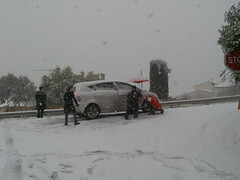 The assistant in the Boulangerie lamented that she had no chains for her car, and I don't think the trains are running. The buses may not be running either. Yes I've often mocked London and SE England for shutting down at the slightest snowfall but here on the Riviera we do the same, and it isn't just a local thing around this village. 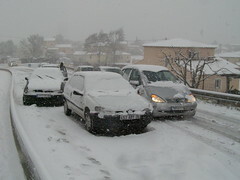 The airport website reports flights as either "Annulé" or "Retardé" and the autoroute traffic website says that the A8 is closed between Brignoles (half way to Aix) and Italy. It isn't just humans who are having their plans curtailed. 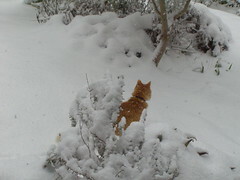 Our cat spent much of the morning looking plaintively at us and demanding that we get rid of this white stuff. 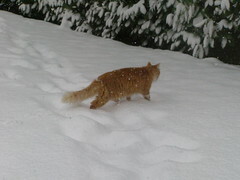 This afternoon he made a brief foray anyway but he made it clear that he expected things to be returned to normal ASAP. As I post this the snow has more or less stopped - we're down to a few flakes falling - but the skies are still gray so more could well fall. Note: If you click on the pictures you'll see them enlarged at my Snowpocalypse flickr album which I'll update as I take more images. Recently the whole "authors won't get paid for ebooks" thing has bubbled up on teh Intertubes again. And in the process we are shown (yet again) that some people are living in cloud cuckoo land. So let me first of all put down a few facts - mostly unpleasant - and then after that I'll try and show that there is still no need to despair. Ebooks aren't going away and will gradually take a majority of the reading market. The well understood pre-ebook business model is dead. The barrier to entry has collapsed. Some of this is pretty obvious. ebooks are here to stay because people are becoming ever more used to reading on screens - younger people especially - and with increased battery life and screen quality the reasons to prefer paper are disappearing (not gone - but reduced so that the trade-off between the two formats is more equal). Since ebooks and electronic reading are here to stay it should go without saying (but apparently needs repeating) that it is going to be ever easier to bookleg books. Since, in order to read an ebook, it has to be displayed on a screen DRM is doomed to failure. Separately the traditional publishing distribution chain is toast. It has been on life support for at least a decade as various parts of the distribution chain have confused books with breakfast cereal and attempted to sell the former with logistics, marketing and sales methods developed for the latter. This essay talks about music but it absolutely applies to books too. If the retail presentation of books is like that of soap powder then is it any wonder that would-be readers are confused? And confused prospective customers rarely turn into actual paying ones. This looks like it could be promising except that the models for online book sales don't seem to be well developed. In trying different ones I have no doubt that people will make mistakes and making mistakes is likely to be fatal for companies that make too many of them. On the other hand not making any attempt is also certain to be fatal and the publishers (and Amazon, B&N etc.) are well aware of that. 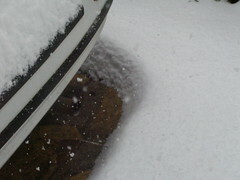 But there's another problem. The barrier to entry for a new author/publisher/distributor is now much much lower. Services such as Lulu (or CreateSpace - Amazon's equivalent) make it trivial to offer books printed on demand. Offering ebooks is even easier, all it takes is a website and paypal to do it yourself and of course Amazon and many others will cheerfully rip off the aspiring author provide ebook publishing and sales channels too. On the other hand, the number of authors who can make a real genuine living out of the craft is small (it always has been) and shrinking because on the whole individual titles are selling less and royalties/advances are not increasing in line with inflation. Combine this with the aforementioned thing about the barriers to entry being lower and it becomes obvious that authors have to do even more than they used to in terms of marketing themselves and their books. In the non-fiction area it is clear that it really helps a would-be author if she can bring a (large) bunch of potential readers to the publisher before the book is even written. To some extent this is true in fiction as well (not as direct but it certainly doesn't hurt if an author has a loyal fan base) and this tends to make it really hard for adequate midlist authors to make the jump to bestsellerdom. Obviously nothing is predictable (if it were no publishing house would print anything other than bestsellers) but as a general rule the catch 22 of needing a large fanbase to become a bestseller and getting a large fanbase from being a bestseller is getting more and more vicious. Finally having gone over all the bad points I think I should point out that there is no turning the clock back. People who dream of some past golden age when lots of authors could live from their career and where they didn't have to market themselves beyond some nice "all expenses paid" leisurely book tour are living in fantasyland. Unless a miracle occurs the total volume of books read is going to stay fairly steady while the numbers of titles on offer is going to keep on growing fast. I think we need to look at just how bad things are now in reality. This should help set expectations for the "hope" section. Note that I'm looking at the figures for run of the mill authors, of which there are hundreds, rather than the few dozen bestsellers. Short fiction pays around $0.05-$0.15/word and most places that accept short fiction either cut the rate when the story gets too long or just reject over long stories. A 10,000 word story at $0.10/word pays the author $1000. There are occasional exceptions to this but I would say that $1000/story is a pretty good rule of thumb. If you want to make a living out of short fiction you need to sell 3 or 4 stories a month which means writing one pretty much every week. Unfortunately even if you can write one a week you probably can't sell them all unless you can write under a dozen pseudonyms in three or more different genres. Short fiction is bad but novel length writing is not necessarily much better. A typical new author/midlist author will get an advance for a book of around $10,000 (this is an order of magnitude thing - the advance could be $5000 it could be $20,000 but it isn't $1000 and it isn't $100,000). Assuming the book earns out but only just an author would need to sell two or three of these a year to make a living out of writing - and if his advances are at the low end by make a living I mean make something slightly more than a part time worker on minimum wage (20 hours a week, 50 weeks a year @$10/hour = $10,000). This by the way is almost exactly the situation of Elizabeth Bear (and it should be noted that I'm ignoring the agent's 15% cut in this analysis). In order for the author to earn out his advance the book will need to sell between 5,000 and 10,000 copies in hardcover and perhaps 30,000-50,000 in mass market paperback (these numbers are orders of magnitude ballparks not set in stone). For a hardcover the author gets about $1.50/copy so the book needs to sell 6666 copies to earn my notional $10,000 advance. Typically a hardcover print run is about 10,000 so that means the sell through needs to be 66% which is good but not astronomical. My recollection is that sell through these days is generally around 50% but that it varies significantly. I think it is fair to say that assuming our author continues to get contracts he'll get sufficent sell through to make the print run break even whether or not that equates to 50%, 66% or 90%. But note the total number of actual sales here: 6666. Trade paperbacks are priced about 2/3rds of HC and mass-market paperbacks about 1/3rd and (not terribly surprisingly) the royalty rates, amount of books that need to be sold etc. are proportional. But lets make it clear here even going on mmpb volumes the total number of books sold to actual customers is likely to be around 25,000 for a successful book. Tobias Buckell (he gives numbers in his long post about Amazon and ebooks) is another author right in this category. He has books that have sold thousands - some are in five figures but not all - and he seems to count as moderately successful. Critically we also know that publishers rarely reprint even when sell through is very high because they don't want to take the risk that the reprint fails to achieve adequately fast returns. Hence the book then goes out of print real soon and never, ever gets a chance to catch on later. Lois M Bujold wrote an essay about the mechanics of publishing a decade ago - and things have only got worse since - that explains why this happens. So to wrap up the numbers, if we are to keep authors reasonably happy then midlist writers need to get about $10,000 per novel and ideally $2000 per short story. And for printed books this means there needs to be a solid core of around 10,000 readers (less for HC more for mmpb). Moreover we also know that unless the book sells out almost immediately the 10,000 readers who buy it initially are the only readers that book ever gets. As noted at the beginning there are the obvious exceptions - the bestsellers are a whole different ballgame because they get to shift hundreds of thousands of copies of their books and get paid enough that they can live on one book a year or less. But there aren't many of them. There are also those people who get to write just one (or two) bestsellers and never sell another word. We ignore them too. Our target here is to give a writer an income of (about) $30,000 a year based on her getting an initial $10,000 a novel and $2000 a short story. This means our author needs to write 2-3 novels and a half dozen short stories per year. This is not easy but it is also far from impossible as many writers do indeed write this much. What we also know is that currently ebook sales per title tend to be in the hundreds and that while this number is going up it isn't yet at even hardcover sales numbers. Mind you not all ebooks are equal. Baen is, I think, the obvious outlier here - my understanding is that webscriptions sells around 3000 monthly bundles and that some bundles, and some individual books/eARCS, sell more than that. But Baen books are significantly cheaper than most ebooks (as in half price or less). Putting that together I'm guessing there are probably at least 1000 people willing to pay $5 or so for any decent (i.e. properly edited/proofread/formatted etc.) ebook and a smaller number willing to pay more. If 1000 people paid $5 for an ebook and the author got all of it then we'd be half way to the $10000 total. Now as it happens we know from various crowd funding efforts (e.g. Save the Dragons, the Liaden Fledgling/Saltation drafts) that under the right circumstances people will pay $25 or more for an ebook - a handful will actually pay $100 or more. You typically have to offer them something extra - the book in hardcover when released say - but, as the Baen's Universe tuckerization trick showed, what you offer need not be a physical good. If we have 200 people paying $25 because they want to be named or something and 1000 paying $5 then our ebook has just met our target of $10000 assuming all money goes to the author. That would seem to be excessively generous of our ebook publisher, but there are ways around this. How about considering the example of the Baen eARC trick ($15 for a pre-release version) and look to add in some variable pricing. Say the book costs $15 for the first 2 weeks, $10 for the next 6 weeks and then $5. The poor will hold out until it costs $5 but the keen (and richer) fans will pay $10 of $15. So assume that we have a group of 200 "Patrons" who get tuckerized, get signed bookmark/bookplates from the author and the like and who contribute - on average - $30 per ebook for those privileges (and because they like the author) and who, as part of that get the ebook at the same time as the $15 folks - with the same publisher 30% of $15 = $4.50 knocked off - then we get to $51'' again slightly over the $5000 target. A total of 1200 people paying a mix of amounts from $5 to (say) $75 for the ulitmate redshirt level will pay our author $10175 a book. They will also have given the publisher $3075 which probably isn't a profit but would certainly pay for basic formatting, webhosting etc. We might recall the 1200 people is somewhere under 20% of the break even point for readers of hardcover books but yet our author is already getting money up at the midlist author advance level of payment. Anything else we get is gravy and in order to get that gravy we need to grow the market. So we start with offers e.g. after a year get the book for $2 as long as you also buy another newer book by the same author and then as eventually (say after three years) put it out for free as marketing but allow donations and so on. The only problem with this model is that in general, current publishers and distributors are not going to be willing to settle for anything like their part of these numbers. But if the current lot continue to commit market suicide the way they seem to be now this may not be so much of a problem because some new entrants will take their place and choose a model like this. In the way that coincidences do seem to occur on teh Intertubes, two bloggers I follow were talking about diet and food this week. Firstly there's my former boss John GC's Amazing Diet Secrets Revealed!Which talks about following his experience in following The Hacker's Diet and his revelation regarding the "colarie" - the amount of energy in a can of (regular) coke. But I think his real key understanding is that if you eat well and slowly you don't feel the need to eat lots. Secondly, via Scalzi, there is Deanna Hoak's advice for those of us that work in front of computer screens all day long. And I think it particularly applies to those of us who work from home. Her tip about only having water at the desk is one that I independently hit upon and I think it is particularly sound advice. I also recommend having the water in a smallish mug so that you have to get up and move every half hour or so. Really it's a good thing! and actually helps with concentration. One thing that neither writer talks about directly is exercise - they leave it as "a good thing". Me, I'm rather more exercise inclined so I figure I'm going to add some paragraphs on that subject. The first thing I note is that there is exercise and exercise. Even a little regular exercise is better than no exercise and that you probably don't get massive benefits from lots of exercise (or at least not directly). I have rediscovered a number of times that if you can walk or cycle to/from work most days a week that is sufficient exercise to keep you adequately healthy. And of course for people with longer commutes there is no need to insist on walking/cycling the whole way. Some tricks I have used include walking to a more distant station and parking the car some distance from work and just walking the last kilometer or so. Now that I work mostly from home the trick is that I go out and buy a baguette for lunch most days, a similar trick can be done by people working in offices. Another trick is to always take the stairs not the elevator/escalator. Likewise if parking for going shopping or something similar park further from the entrance instead of next to it. If you follow these steps you will quickly get to the 20mins/day that experts think is a basic minimum (and quite possibly closer to double that). This level of exercise on its own will knock an inch or so off your waistline even if you don't change your diet. Then there's serious exercise. The Spouse (aka She Who Must Be Obeyed) has learned to like running so now we do a lot of it - as in 3-4 times a week with typically one each of short (30-45mins), medium (1hour ish) and long run (2 hours plus) each week plus maybe something else. We run pretty hard and are quite fast. Nowadays I quite literally run 1h35 flat half marathons as training runs and we've been known to run 35km (22 miles) on hilly trails at the weekends. This pays off in terms of fitness and achievement - I'm close to maintaining a 4min/km pace (=15km/h) for a half marathon - and it certainly helps my cardiovascular system but it does very little for my weight these days so John is going to remain lighter than me until he goes off his diet. In part because it turns fat into muscle and in part because running like this allows (and requires) me to eat fairly large portions. I can really eat pretty much whatever I want and not worry about the consequences because I burn it off on the runs - this is especially true because we live in a hilly place and so most of our runs include significant changes in altitude and that drastically increases the calories burned. Finally, on the running note, the Instapundit alerted me to a recent studies about running style. It would seem that its a really good idea to try and run with a midstrike than a heel strike even though most running shoes seem to be designed for the latter. I'm trying to change my stride to more of a toe/mid strike which should help with speed and fitness. 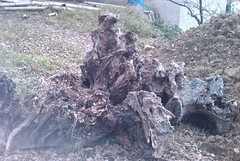 The uprooted stump of an olive tree (I'm 99% sure its an ex olive tree but it could be something else... ). Uprooting the stump like this is about the only way to actually kill the tree. If you just chop it down it will sprout from the base. In other olive related news there's been all sorts of UK coverage about some people who are growing olives under glass in the UK. You will pardon me if I'm just a trifle amused. The longest article comes from the Daily Mail though there are also reports in the Torygraph, the Wapping Liar, the Mirror and probably all the other papers too. Essentially these lovely people planted 180 olive trees a few years ago and have just harvested their first decent harvest of 200kg of olives. These 200kg they have now pickled and are selling at the bargain price (ha ha) of £3.50/100g or £35/kilo. I think I should get into the business. I'll have to find some gullible sucker nice organic shopkeeper and I suppose I'd have to drive the car up to deliver my olives to the UK but I reckon I could quite legitimately get away with "Olives from English owned olive trees and hand-picked by English hands" (makes mental note that this will please Japanese spouse since she will be barred from the work). So instead my approx 70kg of olives netting me 12 L of oil I could have got some £2500 in cash. OK I'd have to give some to the shopkeeper(s) and there would of course be packing, labeling and shipping costs but I guess I'd net somewhere between £1000 and £2000 for about 4 days of labour. Which err actually isn't very much per hour. Lemme see go worst case: £1000/4 = 250. £250/day 8 hours per day = £31.25/hour. OK so that's a good deal more than minimum wage but its rather less than your average plumber charges and a good deal less than I charge for computer related consulting. So maybe I'll just stick to the computing. So the tech world is buzzing about the newest Apple thingie the iPad. One thing that struck the more juvenile end of the commentariat (this includes your humble author) is that the name sounds like a feminine hygiene product. Hence the comparison on the left courtesy of Dizzy. More seriously what is it for? does it live up to the hype and will it be a success? The quick answer to the latter two is "no" and "yes". It couldn't possibly live up to the prelaunch hype so that isn't a great surprise but it is close enough and good enough that I expect it to sell in huge volume anyway. So to go back to the first question and the related one of why people will buy it. I think the answer is that the iPad is Apple's netbook, and I think Apple agrees as you could tell by Jobs' deliberate slamming of current netbooks. So just in the same way that an iPhone took on the top end smartphones the iPad should take on netbooks and run Apple sanitized versions of the same stuff. So compare it to something like an Asus Eee PC 1005PE. Battery life is a wash. On the plus side the iPad weighs slightly less (0.7kg vs 1.25) and the screen on the iPad is slightly bigger (1024x768 vs 1024x600). On the minus side storage is way lower (64GB max vs 250GB on the eee) and it doesn't have a webcam or a keyboard - you can buy one at a price to be determined. It also costs rather more - Amazon will sell the eee for $320 whereas the lowest spec iPad is $499. Perhaps worst from the casual punters point of view, the iPad won't browse websites with flash or java support which is going to break things. Not massively but it means special hacks and pages for popular sites such as facebook or youtube. Finally it looks to me like can't connect to USB (or SD etc.) flash drives directly but has to be synced via an external computer. In other words unlike a netbook, and like an iPod or a Kindle, this is really a content sink. It's a thing that you can read, watch or listen to stuff on and you might be able to make notes and annotate things but there's no way you can use this as a primary computer. This is where the whole concept falls to the ground as far as I'm concerned. My Netwalker is able to do anything the iPad can do (except DRMed stuff) but it can also stand in for my main computer if I want it to. I can share files with people, I can have it set up as a server, I can plug in flash drives and USB hard disks and all sorts of other goodies. I can do practically anything that I use a computer to do (the exceptions are things like running virtual machines or intense graphics editing) and a netbook like the Asus 1005 would even do those things too. In addition, unlike the iPad, my netbook fits in my pocket and the screen doesn't get smeary so, I will not be buying one. The iPad, much like the iPhone, is completely locked down. The user has no control over what she installs on the hardware, short of accepting exactly what Apple has approved for it. From past experience, we know what happens when a completely legitimate application—from a huge company that's actually partnered with Apple—doesn't gel with Apple's business plan. They reject it, and you can't use it. And what recourse does the power user have? What's dangerous about the iPad is that it's much closer to a "real" computer than the iPhone is. If you dock it with the keyboard accessory, it really is just a laptop, probably powered somewhere along the lines of a MacBook Air. And yet this is a computer over which you have absolutely no control. And the question is: If we all continue to buy Apple's locked-down products hand-over-fist (Jobs went so far as to talk about Apple as a mobile device company yesterday), what reason does Apple have not to keep moving forward with that model—a model that, to many, is defective by design. It isn't just a point for hackery types like me, its a serious philosophical point for everyone. Anyone who is willing to trust that "nanny knows best" is fine with an iPad but anyone who thinks that handing over control of your gadget to some third party is a bad idea should look at alternatives. In addition to the obvious (i.e. the netwalker, kindle and other eInk readers and netbooks) there is one obvious direct competitor: the Touch Book which costs $100 less. The Touch Book looks to be pretty similar to the Netwalker in specs except for being physically larger and having more USB ports. Its also not a million miles from the iPad in raw specs too, but unlike the iPad it has a built in keybaord (like a netbook) but there is the neat option of removing the keyboard for greater portability. I think this might be a winner for some applications athough it suffers from the "doesn't fit in pocket" problem of the iPad and netbooks. Philosophically this does things the complete opposite to Apple - it's totally open software and hardware - and you are encouraged to hack it and modify things.